So after planning to avoid any sort of sleep on the Friday evening, in order to prepare the body for the turmoil ahead, Josh and I were both sound asleep by around 1am. The reason being, our participation in the event was put into doubt becasue of the weather forecast, which indicated heavy and prolongued rain on Saturday and Sunday. I have never been a fair weather cyclist, but the idea of cycling for 8 hours in the rain seemed to take away from the experience of cycling the Dunwich. Josh was the one who made me aware of this point initially, and despite my intention to go ahead whatever the weather (no pun intended), after seeing the downpours prior to my departure on Saturday afternoon, I too was brought around to the idea of having a quiet, and warm night in front of the TV. But against all the odds, the skys cleared at around 6pm. The umpires made their decision....the cycle to Dunwich was on. On arrival at pub in the park in Hackney, I was amazed at the sheer volume of cyclists chillaxing, drinking a pint, chatting on with their respective friends/teams or consulting the route maps. It was brilliant, and lived up to everything I had expected. We each gave a pound to the chap handing out maps, and began to work out where we would be going. However, the maps were useless to us, considering we both come from the North of England and thus, had no idea of the road names and numbers of North-Eastern London, and beyond. The plan was therefore changed to follow the peloton. We began at exactly 9pm, which happened to be a similar time that most of the bunch hanging around the pub also left. 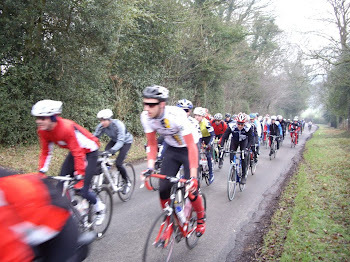 I had no understanding of how many cyclists were involved in this event until we turned onto the main road and came to the first major set of traffic lights. I had never seen so many cyclists before waiting for the green light to appear, it felt like we were in the tour de France. Initially Josh and I held back, chatted to fellow cyclists and tried to target those who we felt we could latch onto to get us to the finish by sunrise. But it soon became apparent that the peloton we were part of were not moving quick enough to give us a chance of seeing sunrise, and we decided to quicken up the pace and move through the pack. This is probably something I would change if I did it again, as I didnt really get the opportunity to have any banter. But then again, for the time we were in the bunch, banter was few and far between. We really motored through the first 20 miles. Worries about getting ahead of everyone, and not having anyone to follow were soon eased as the red lights of cyclists ahead flickered way beyond the horizon. It was around the 20 mile mark where we got a taste of how dangerous the cycle could be. I am still not sure what had happened, but many cycles lined the road and a woman was being seen to by paramedics, already at the scene. It looked like a collision between cyclists, but I wouldnt want to speculate. Either way, it seemed to hammer home to us, and the cyclists around us that this wasnt an event that should be taken lightly. The night seemed to come around quickly, and before we knew it we were at the half way house, which at the time was rammed, but not as rammed as it was by the time we left. It had taken us just over 3 hours to cycle 52 miles. We saw it as a real achievement, considering we had had to negotiate the city streets. We set off again at 1am, after demolishing a cracking brew, a bannana and a flap jack each. As with the previous 3 hours, the time seemed to fly by. I believe the key was not being able to see what was too far ahead of you, the concentration required to stay on route allowed time to fly by. Plus, there were some amazing decents, particularly the one into Sudbury. It was only when the daylight started to emerge that time and the miles seemed to stand still. It became really difficult with around 15 miles to go. By this point we had formed part of a group of around 10 cyclists, one of which had a GPS system and so became the lead cyclist. But I had begun to moan as my back and neck were in agony through the position I had cycled in for the previous 6 hours and for the fact I still couldnt see the coast despite being so close to the finish. This was without a doubt, the trough of the 115 odd miles. Fortunately Josh had emerged from his trough, and tried to pull me along with decent banter, and the promise of a fry up at the cafe on Dunwich beach. With 2 miles left, there it was! The first road sign for Dunwich. We had hunted for such a sign for about an hour, as a group. Then before we knew it, we were in Dunwich, and cycling down toward the beach. It was at this point I realised the reason we hadn't been able to spot the finish was through the beach being almost in a little cove. The sun had emerged some 15 minutes prior to our arrival on Dunwich beach, but at this point I was beyond caring. The final time was 7hrs 35mins 39 seconds. We werent the first people to get there, but we certainly were in no way the last. I know that this is not seen as a race, but too me, it was a chance to see how fast and how far I could go. I was so proud of the achievement, but so tired. Waiting for the lorries to take us back to London allowed us to talk about a couple of things that had cropped up during the evening. The first was how quick the cycle teams were (I think there were a number of teams, but I can only remember the Dulwich team, half of which cycled past us with a few miles to go.) The second was how frowned upon it was to cycle such a route without a helmet. In no way am I proud of doing 113 miles without a helmet on, but it was interesting to hear so much chat about the fact we werent wearing head gear as we cycled past. The entire experience was one that I will never forget. I really pushed myself on this occasion, and the reward was the satisfaction I felt with the time Josh and I recorded, and of course a well deserved full English. An experience that I would recommend to anyone.